The Saturday of President's Day weekend, Beth and I left the Polar Vortex in Washington, DC and traveled to Dallas to visit Alycyn! 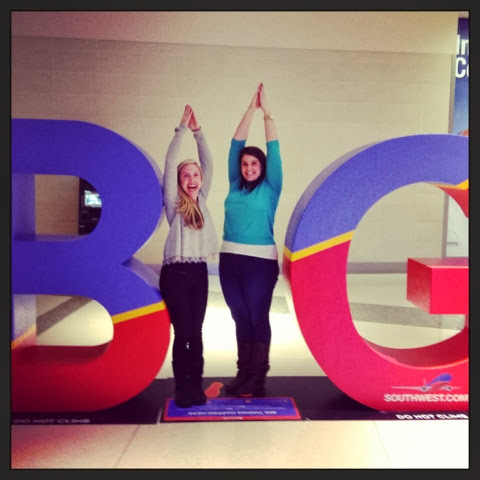 After a short layover in New Orleans (where we purchased the obligatory King Cake) we landed in BIG D! Alycyn picked us up from the airport and had a special guest in the car...Robley! You have read about her in previous posts but for a quick refresher she was my college roommate/sorority sister. Our first stop for the evening was Alycyn's cute new apartment. It is awesome! Not only is it decorated perfectly but hello closet space! 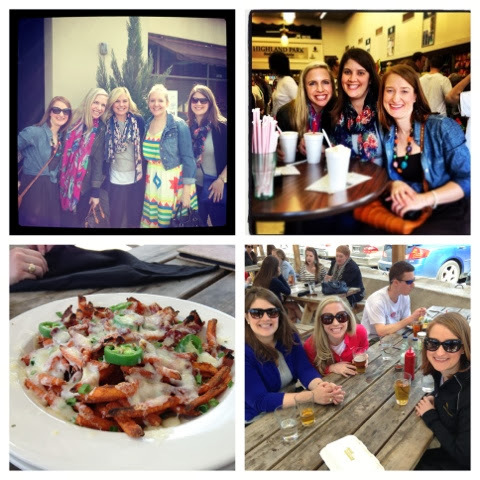 While we changed clothes and freshened up, we sipped on some Champs, visited and laughed. There is nothing better than reuniting with friends! 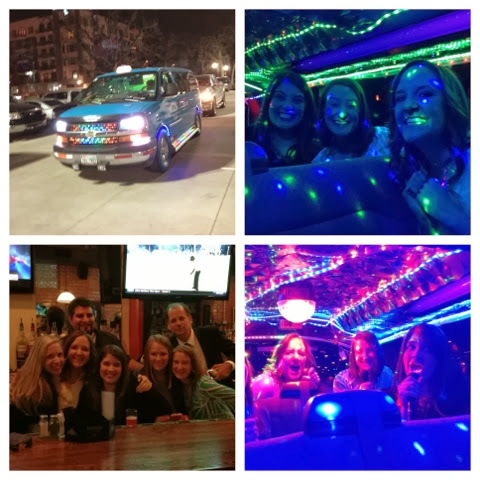 Once we were beautified, Alycyn's coworker/friend scooped us up and we went in search of food and libations. That is when we found The Rustic. OMG! I loved that place. Everything was spot on from the decor, to the energy, to the live music. Plus, Pat Green is partner in the bar/restaurant! For my non-Texan readers, Pat Green is a Texas Country artist. Google him. I bet you have heard some of his stuff. 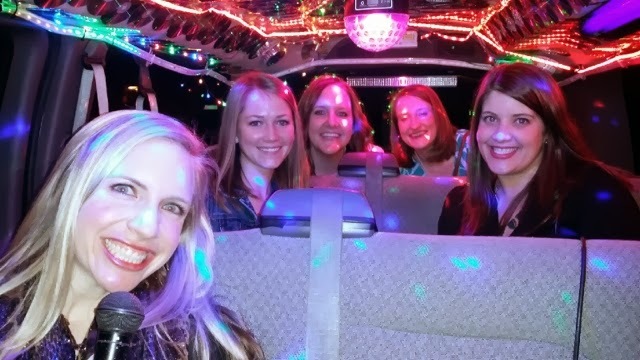 We had a round of drinks and then it was time for the Karaoke Cab. Alycyn had spotted the KC when she was down in Dallas for a work trip last year. 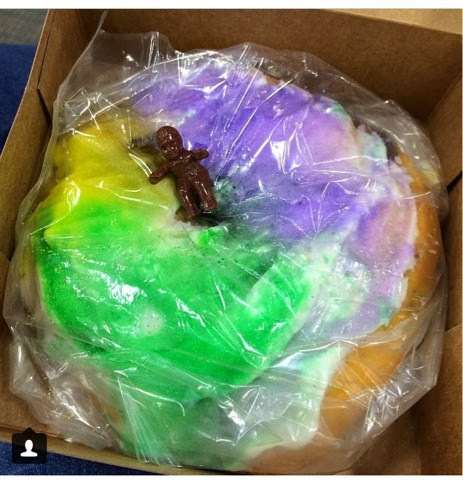 She had sent it to Beth and I, and we all knew it was a must-do for our trip. Alycyn made all of the arrangements and promptly at 10pm the cab drove up. The lights and music blaring and smoke pouring out of the open doors and windows. AMAZING! For over an hour, we screamed sang at the top of our lungs to classics by The Spice Girls, Beyonce, Alanis and the Black Eyed Peas. I will never think of the song My Humps the same way again but that requires a whole other blog post to explain. 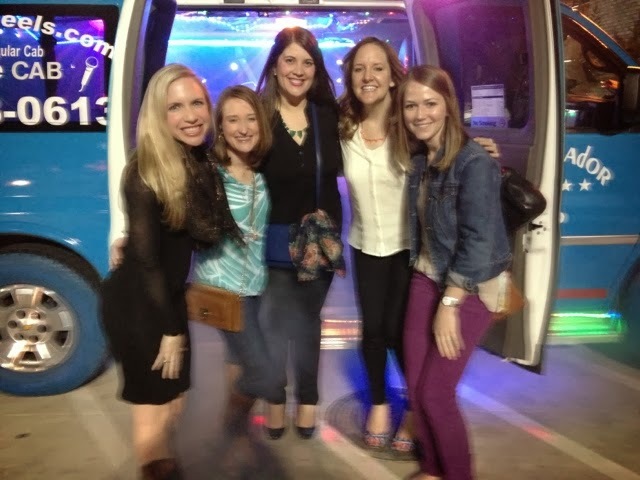 Seriously if you are ever in Dallas go to The Rustic and then hop in the Karaoke Cab. This photo is not blurry...that is the smoke. The next morning we woke up bright and early and met our friend/fellow Zeta/my old roommate Michelle for brunch. I hadn't seen her in sooooo long, and it was great to catch up. Later that afternoon we drove around Highland Park to checkout all of the incredible old homes. There happened to be an estate sale going on and we stopped in to check out the mansion. If I had several million dollars in the bank I would have bought that house in an instant. It needed A LOT of work, but it was gorgeous. After the house tour, Robley had to head back home. I was sad to see her go, but so thankful we got to spend such a fun 24 hours together! Monday morning, President's Day, we donned our workout clothes and went for a walk on the trail by Alycyn's place. Along the way we decided it was time to eat again and stopped for some local beers and loaded sweet potato fries. 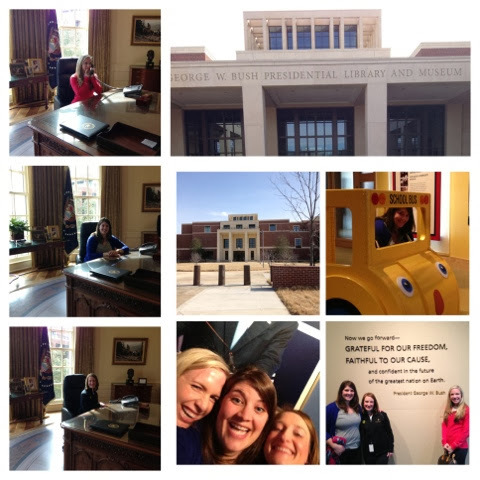 That afternoon we went on a tour of the new George W. Bush Presidential Library. Now it is no secret, I love me some W but regardless of my bias, I think the library was really well done. I loved the exhibits and all of the special touches. However it was even better going through the library with Alycyn who gave us a lot of behind the scenes knowledge. It was the perfect way to spend President's Day. Sadly, after our visit, it was time for Beth and me to board our planes. She was heading back to DC and I was on my way to San Antonio (recap soon). We were SUPER sad to leave Alycyn, but luckily we knew we would be seeing her again in less than 3 weeks. That definitely helped numb the pain. Despite being from Texas, I have never spent a lot of time in Dallas. It is like the other end of the earth from where I am from....slight exaggeration but it really is far. With that being said, I went into this trip not really knowing what to expect. I obviously knew I would have a great time because I was with my friends, but I didn't realize I would love the city so much! Alycyn's new neighborhood is great, and I am already excited to visit her again in Big D! Have you been to a Presidential Library? The only other one I have been to is George H. W.'s which is in College Station. WHOOP! I want those loaded sweet potato fries right now!